First off, I have to say that this song is already kind of old to me, going into this review. It might not seem like it now, but back a while ago I used to be a pretty devoted fangirl to Yoshizawa Hitomi; I loved everything she did, and that included their songs. I listened to Seishun no Custard WAY too many times, and now when I listen to it it sounds like one of the oldest songs to me. I don’t know why I listened to this more than other Yossy solos, Sono Deai no Tame ni and Yoshite, Yoshite, but I just did. So, let me just get that out of the way. It’s a great song, don’t get me wrong, I just have heard it way too many times. When I first saw the setlist I was slightly confused. Korenaga Miki was going to be singing instead of Satoda Mai? When Satoda’s the one who recorded the song and is honestly a better singer than Koretty? However, I’m actually pretty happy about this. I’ve said this once and I’ll say it again, but I love each and every member of Ongaku Gatas, and so this is obviously part of their effort to make the Egg members actually do more. Korenaga only got one non-group song on the Ongaku Gatas album and that was the Egg song, Koi Uranai Doori ni wa Naranai wa, whereas every member except Mutou Mika and Korenaga Miki got one more small group song (and KonKon and Rika got two). So having these small groups right away that really bring out the Egg members I think is a great ida, and I’m very happy about it. That being said, I really do think that Seishun no Custard is a good song; actually, listening to it again, I like it a lot more than I did the first time I watched this concert. Like I said earlier, Satoda is really a better singer than Korenaga. However, Koretty obviously was doing her best, even if her performance was slightly stiff. Yossy’s performance was looser, but that’s come from her 10 years of experience in the music business. Both of the girls looked like they were having a lot of fun, but Yossy looked like she was enjoying it a bit more. I can’t remember right now if Korenaga has had a song in this small of a group in either the 1st Goodsal or Come Together tours, but she’s generally the least noticed of the egg members, so there was probably a bit of nervousness involved. It’s times like these that I remember how much I loved Yossy.. I really did like this performance. I mean, Koretty wasn’t as enjoyable to watch as Yossy who was really fantastic in this performance. However, seeing the two of them together, one of them a seasoned performer and one of them someone who barely sings in her performances just made me really happy. Confession time; before I listened to this concert I had not heard this song. I do like every thing Gatas puts out… but the song Come Together is kind of Gatas’s weak link. I love it (even though I love the PV more for a very very specific reason), but it’s no where near as much of a good song as Gatas’s first two singles, Narihajimeta Koi no Bell and Yattarouze; it sounds more like a generic pop song than the disco sound of its first two songs, the sound I love (that kind of inspired the name of Happy Disco). However. Man oh man, was I missing out on Aisaretai Aisaretai! This is an upbeat, fun song that after I first heard it I had to keep listening to it over and over; I just loved it that much. This is exactly what I love about Ongaku Gatas as a group; they do great pop-disco tracks. And this performance didn’t disappoint at all; the dancing was some of the best of the concert, great singing all around, and all the girls looked like htey were having fun again. Like I said, the dancing’s pretty cool; it’s not choreographed as much as other H!P concerts can be, but it feels looser and really fun. One part of the choreography I personally like is when all the members surround Yossy for her big solo and it just looks TOO cool. They changed costumes in between! I didn’t comment on those yet. 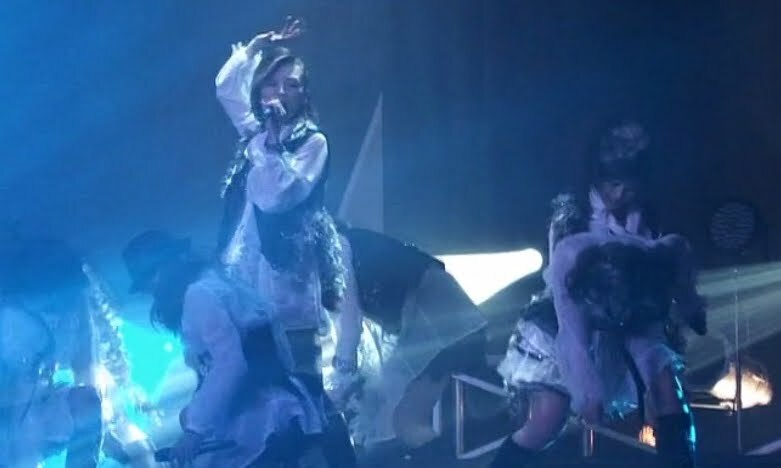 These are actually some of my favorite H!P concert costumes; they’re cool looking with the black and white, the black jackets/faux corsets, the ties.. It’s cool and special enough to be a costume, yet it doesn’t look ridiculous, goofy or just plain strange (I’m looking at you, 1st Goodsal costumes near the beginning). All the girls look great in them and these are really what idol concert costumes SHOULD be. Seriously, these costumes are fantastic. I want Rika’s hat. Other than that I really don’t know what else I can say about almost every performance in this concert. All the girls are really into it all, singing great, performing well. 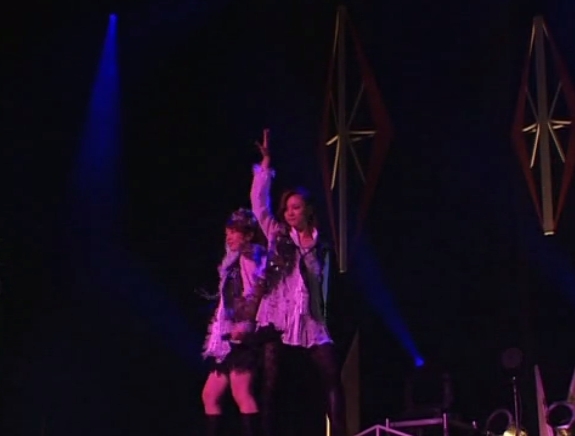 The choreography, costumes and great performances really make this one stand out, though.